For Michelle, yoga has been a long process of coming home to herself and building a sense of self-love and care, a practice that she cultivates every day. Yoga has been Michelle’s most powerful tool to sort through emotional, physical and spiritual pain, and fully integrate these aspects into her being. Michelle’s yoga practice centers around a chakra specific vinyasa flow to bring balance and release to the body’s energy centers, as well as verbal affirmations and mantras to give the mind a positive direction in which to focus. 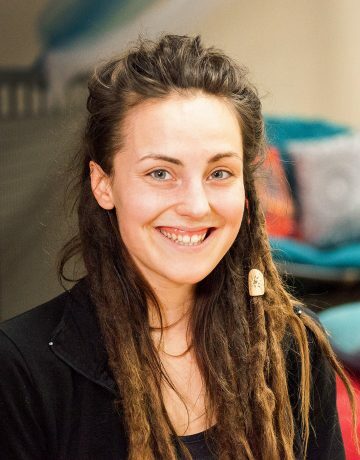 Michelle completed her 200 hour yoga teacher training in 2018, and graduated from Berry College as a Bachelor of Animal Science. Outside of yoga, Michelle’s interests include horseback riding, playing instruments, art, and hula hooping. Michelle wishes to share a piece of her peace with her students through teaching yoga, in hopes that humanity as a whole can transcend its collective suffering. I started practicing yoga in 2013 when a friend from out of town came to visit and showed me a yoga sequence in my living room. At this time in my life, I was very curious about mindfulness activities like yoga and meditation, so I opened myself up to learning what Rachel had to teach. I have taught yoga since May 2018. I wanted to become a yoga teacher to deepen my own practice and be a resource to others on their yoga journeys. My advice is not to rush. Move slowly. Allow yoga to heal you at your own pace. My favorite class to teach is Slow Flow, which I teach when I can substitute it. My favorite class to take is Strong Core. The most treasured aspect of M3, to me, is interacting with other yogis!.